Lorena Stanford, a 45 Year old woman from Connecticut, USA, has just uncovered the face of her beloved 4 year old pet Minnie to the world. 4 Years before Lorena owned 3 female rabbits and a white Persian cat male. One day, one of the rabbits got pregnant. 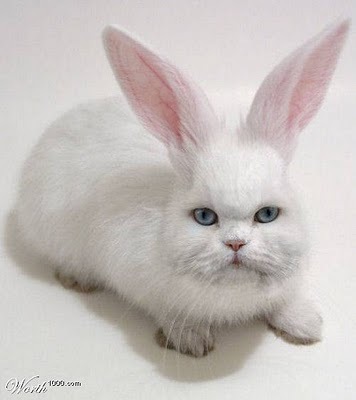 The rabbit then gave birth to Minnie, a cat-rabbit cross. “This is the first time we’ve ever seen anything of the kind!” Says Ben Harvy a scientist at the University of Connecticut. Lorena will next try introducing Minnie with a neighbor’s tiger cat. Well, let’s see what that will make!